Ogden High School is one of most important examples of Modern architecture and Art Deco interior details in the state of Utah. Its preservation and restoration is a testimony to the place it holds in the hearts of Ogden residents. Ogden High School was designed by the local firm of Hodgson and McClenahan. It was built in 1937 with a local bond issue and funds from the Public Works Administration and the Works Progress Administration, New Deal programs during the Great Depression. In 1983, the building and its sumptuous auditorium were listed on the National Register of Historic Places. Leslie S. Hodgson (1879-1947) was considered the most important architect of the Ogden-Weber area from the late nineteenth to mid twentieth century. 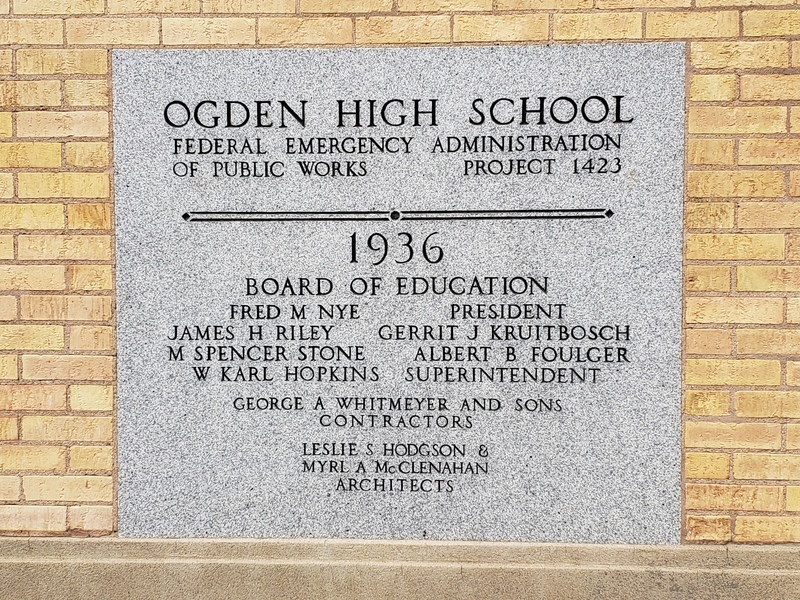 Ogden High School is regarded as his “masterpiece.” As described in Preservation Utah, the building has three elements: Zigzag Moderne - realized primarily in skyscrapers such as the Empire State Building with its familiar step-back top; Streamlined Moderne - used in gas stations, diner and roadside amenities, where corners curved and parallel lines in buildings echoed the streamlined effect of new cars and locomotives; Classical Moderne - an adaptation of Greco-Roman style with Deco elements. The cost of the Ogden High School came to about $1.2 million, the first high school built in Utah to exceed a million dollars, at a time when people were struggling to survive on $50 or less a month. 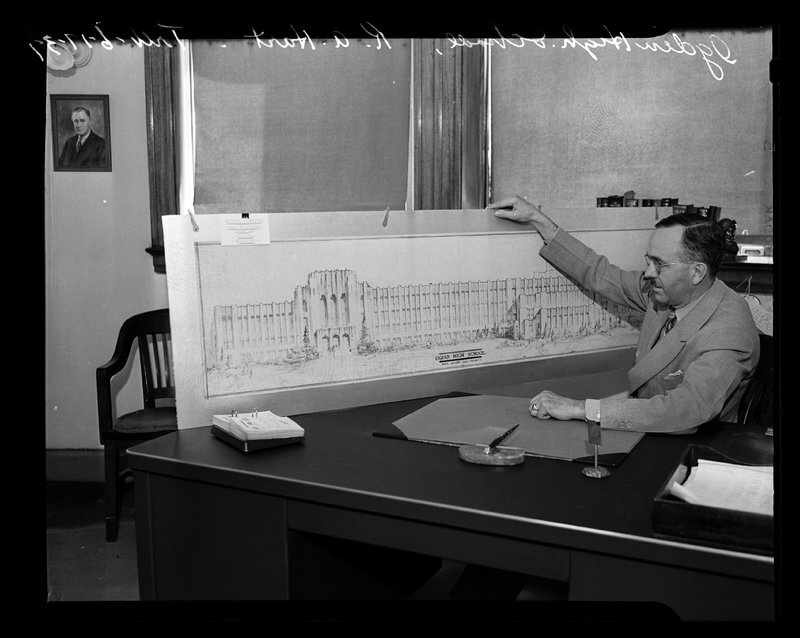 Many taxpayers protested the building of such a lavish educational facility; it became labeled the “million dollar high school.” However, seventy years later, the community rallied to save and restore the building with a bond and nearly $9 million raised by alumni in support of the $64 million project. Traditional building skills were used to restore the breathtaking auditorium, and the original gym was transformed into classrooms, performance spaces, and science labs. A new entryway was added, and upgrades throughout the building made the school more energy-efficient. The building received a 2013 Preservation Honor Award from the National Trust for Historic Preservation in recognition of its successful restoration. 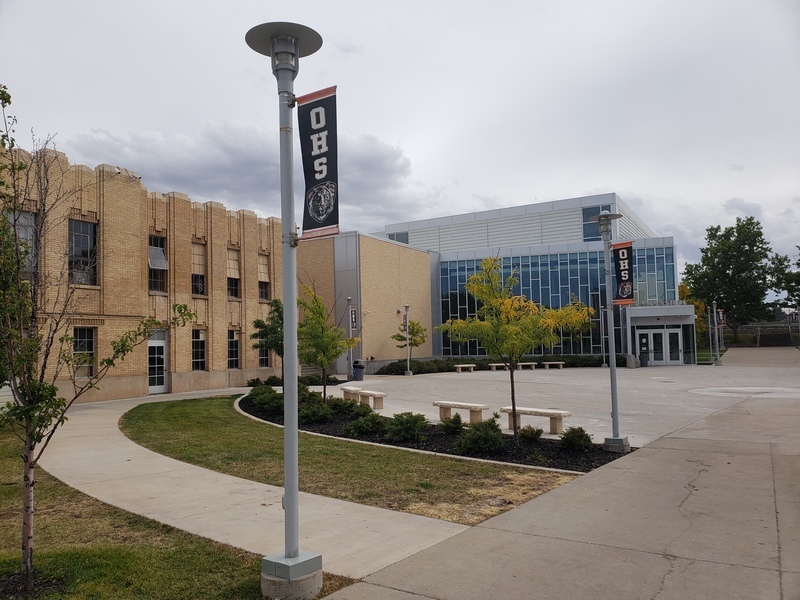 Ogden High School newly completed ~ Source: Used with permission from the Utah State Historical Society, Photo #07089, https://collections.lib.utah.edu/ark:/87278/s6pv6tdx. ,” Intermountain Histories, accessed April 20, 2019, https://www.intermountainhistories.org/items/show/262. Bartholomew, Becky, “New Deal Agencies Built 233 Buildings in Utah,” History Blazer, June 1996. Gladwell, Louis. Ogden Standard Examiner. “’Million Dollar School’ was a Boon for Ogden.” 5 September, 1982. Manson, Pamela. Salt Lake Tribune. 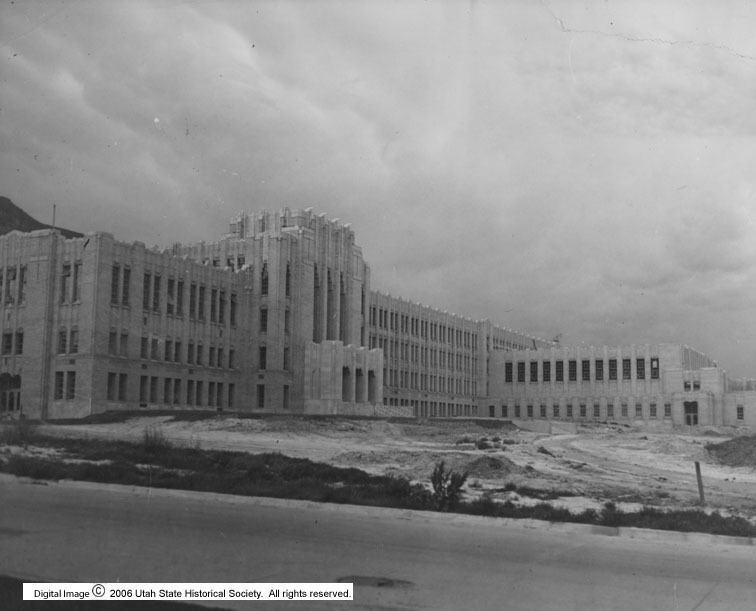 ”Renovation of Ogden High Auditorium Wins Recognition.” 30 March 2013. National Register of Historic Places. Ogden High School, Ogden, Weber County, Utah, #83003201 National Register. Ogden Standard Examiner. “Steel Being Placed for Roof Structure of School Building,” 27 September, 1936. Preservation Utah website. 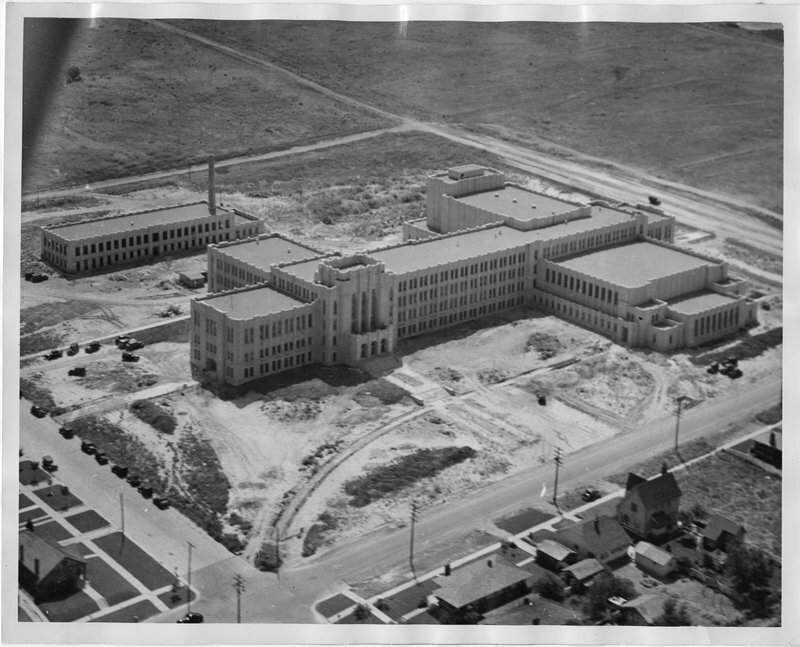 “Ogden High School,” available at https://preservationutah.org/see-our-impact/our-advocacy/item/40-ogden-high-school. Wieble, David., from the National Trust for Historic Preservation website. 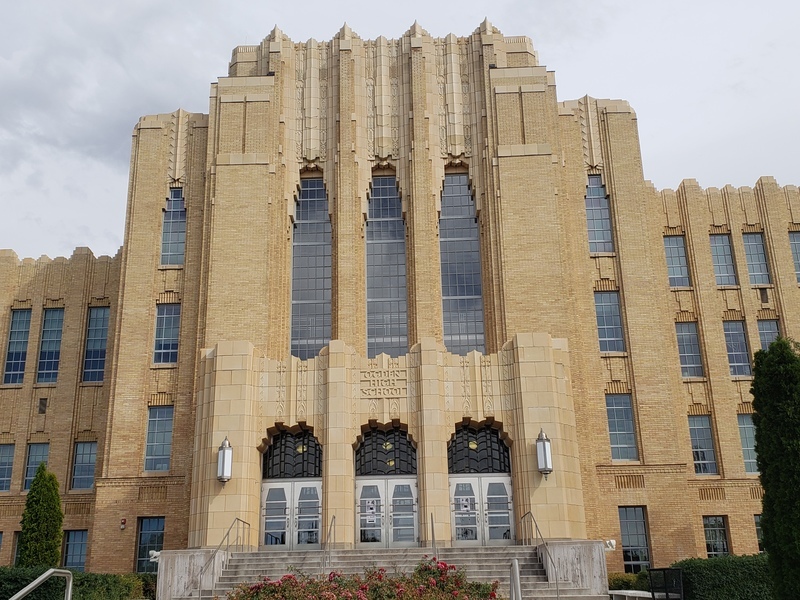 “Ogden High School: How A Utah Community Saved its Beloved Art Deco Gem,” available at https://savingplaces.org/stories/ogden-high-school-how-community-saved-art-deco-gem#.W2yUnNJKiM8.